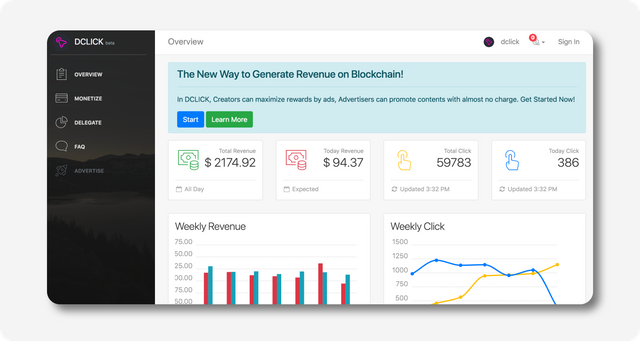 Let us introduce you a new Steem Blockchain based Ad Platform - DCLICK. DCLICK is a project aimed to connect the Creators and Advertisers. The Creators can include an advertisement in their contents and receive the rewards based on content clicks. The Advertisers can promote their own content in DCLICK as well with almost no charge. I’m sure most of you are aware of Google AdSense. The Prototype is similar to Google AdSense. You receive rewards from the clicks of links and views of clips from any blogs (Steemit or other platforms) or movies via DCLICK. However, the producers receive more rewards compared to AdSense and advertisers can promote with almost free of charge because of Token Economy. 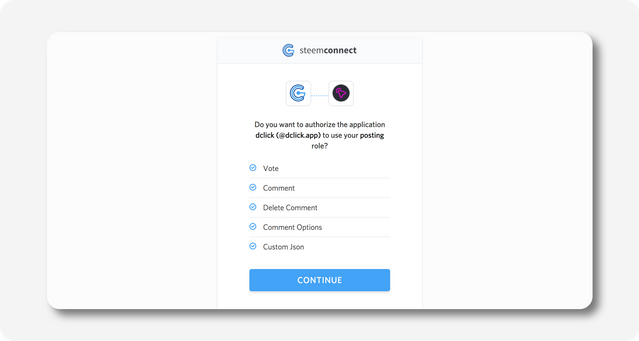 Access to https://www.dclick.io and Sign In via SteemConnect. You can select Overview Tab to check your current revenues. Upload posts in Monetize Tab as usual. The posts are automatically registered in SteemIt. You can click SHOW AD checkbox to see which types of advertisements are adhered to the posts. Congratulations! The advertisement is adhered to the bottom of your registered post. You receive rewards when people click it. The rewards will be provided by DCLICK Tokens. Tokens are exchanged to votes until SMT opens. 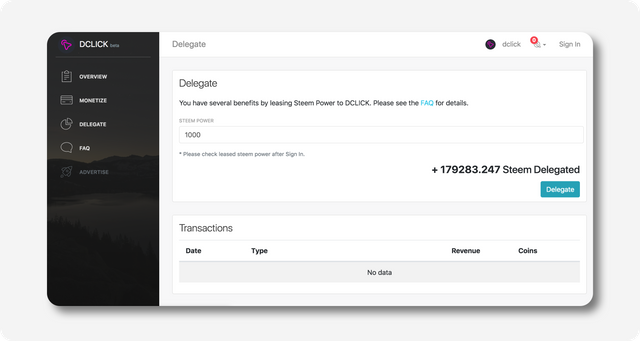 Select Delegate Tab and enter Steem Power you want to lease and click Delegate button. You have several benefits by leasing Steem Power to DCLICK. You receive 30% of the profit from weekly based on leases. You receive 30% of the DCLICK Tokens that are issued daily based on leases. Tokens are exchanged to votes until SMT opens. Your most recent posts will be advertised for free. Advertising options will be available soon but these are the steps. Register the content you wish to advertise and set an advertisement goal. Pay required expenses through STEEM or FIAT Money. FIAT Money will be automatically exchanged to STEEM internally. The advertisement registered in the post will be exposed until it reaches the goal. Once the advertisement reaches the goal, you receive payback of advertisement fees. 1. It connects STEEM and real world. You receive rewards from clicks from any users - both Steemians and Non Steemians. Also, you can earn rewards by exposing advertisements in any posts not limited to SteemIt. 2. You can receive rewards after 7 days. The advertisers can receive continuous rewards after 7 days unless the advertiser ends advertisements. 3. You can proceed advertisements with almost free of charge. You can deposit tokens in the platform during advertisements and receive them after they are completed. It’s similar to Steemit’s economy. When producers make clicks, token are issued and given to the producers. Advertisers prepay advertisement expenses by Steem to proceed with advertisements. You receive tokens as payback of advertisement expenses at regular intervals just like Steem Powerdowns. The payments’ ratio and waiting time is based on the proportion of issued tokens from clicks. We’ve proceeded 2 weeks of Alpha Test and paid $2.2k as revenues and leased 180k Steem Power during this period. We’ve received numerous positive feedbacks and several Steemians introduced about us voluntarily. So, we’ve decided to proceed with Beta Version of our Official Launch based on these inspirational feedbacks. Any feedback is important to us. Please contact us to channel below if you have any inquiries. It is not easy to make significant revenues from content production as some people may think. Even though it’s a high quality content, it is difficult to be valued before being noticed. Also, it is difficult to be leading to revenues even though people view the posts. DCLICK has begun with the purposes above. We’ll challenge ourselves to reach the goal, so please stay with us. Lastly, we highly appreciate witness @clayop who’ve trusted our potentials and invested in Steem Power. We hope all Content Creators to gain revenues in Steemit. Wonderful idea. Reading this post I was lured to try it soon. You got a 5.21% upvote from @emperorofnaps courtesy of @discernente! Seems like we need to create the post at dclick website now? I am sure many steemians have our own preferred posting platform like busy or esteem and I use steempress alot. Wondering if we could still continue to use dclick advertising platform if we are not posting from dclick website. Currently, we only provides dclick publishing functionality, but in the future, such as ad code insertion or ad image insertion in other places will be available! I'm building a little dapp myself and looking around for usable advertisement options to allow the authors a reward after the 7 days. There is always a, lets say a "bad smell" if you have to include some iframes into the page. Not only there is alot of trouble because of GDPR in europe, but also a risk involved. If as example, my app could get the ads via. an api from your service, i could display them better and without any risk for the user, maybe even pictures. If an advertisement is in my post and the advertiser is no longer paying for it, is it going to be there forever or removed? Most likely, the ad will not be deleted, but will be exchanged for another ad that is paying. Id like to talk more about cooperation. This sounds great, I'm gonna have to try it out one of these days. Good job! You know what this means? Any advertiser will effectively be buying STEEM to buy ad space. Any Steemian using this will thus provide advertisers an opportunity to create upward pressure on the price of STEEM, particularly those with significant traffic such as you. At this point, this opportunity is best suited for monetizing content at least week old. It’s a fantastic idea ! So if I understood correctly, we can make our own posts through @dclick and the system will put advetisements below our posts? Can the posts we write be about anything? I'm eager to try @dclick as soon as I know how to. Yeah, something along those lines. But I wouldn't want to put off my readers by placing ads in my post at this point. Old posts are a different matter. Are rewards given only when the clicks were made by Steem users or are clicks by anyone all counts? You receive rewards from clicks from any users whether steemian or not! Oh cool, hope it lasts! This is a good idea. A service like ADwords but without the centralized authority to skim off value from the transaction between creators and advertisers. Yes, that's right. As far as I know, they usually take a huge portion of the profits that creators are generating. We will share these benefits. Are you sourcing programmatic ads or sourcing ads manually ? Since you are using CPC model and CPA model, you are losing money which you could have generated using on CPM model ? Since you are not really tracking any thing on the blockchain, why you need the tokens ? We are currently promoting the latest posts by steem power delegators for free and plan to have a system that will automatically run ads as soon as possible. Since we can not get exposure information of steemit post, we will use cpc and cpa model only. 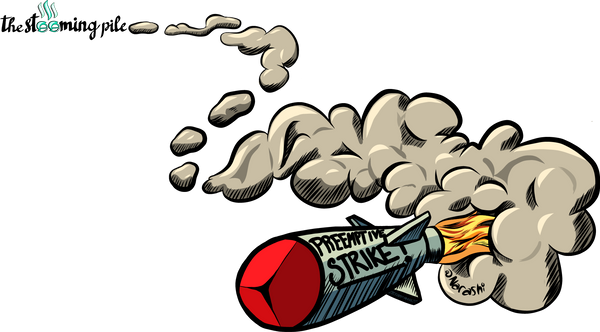 In the case of an ad running outside of steemit, the cpm model is also under consideration. This is because the calculation is easy, and it is easy to switch to SMT. In DCLICK, there are various kinds of profits. There are many advantages to handling DCLICK tokens rather than treating them all differently. It is also possible to switch smoothly when SMT is opened in the future. We will measure impression using traditional methods like counting the requests. 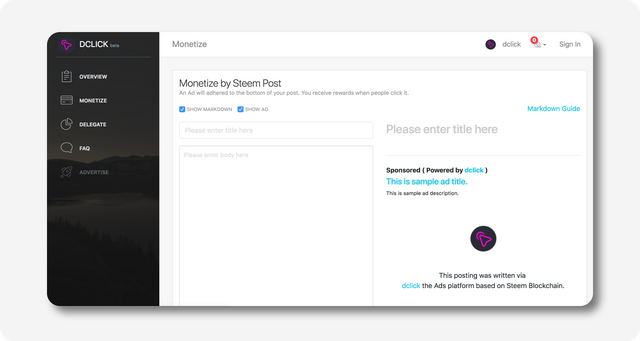 amazing, its like clickbank or commisiion junction but for steemians, and no ID and credit card, just get some adsense style ads in your steem posts wow, but is there a way to automatically ad ads to my posts without having to manually put in the url? or am i just lost? Alright, this is the sort of thing I have been waiting for. Paid advertising opportunity on the steem blockchain. Will see how you develop this, however as it stands now the requirement for people to publish content through your interface won't work IMO. Let people incorporate adds into their posts through any mechanism they would like, and I can see this becoming very successful. Wow! I was expecting similar thing for a long time! 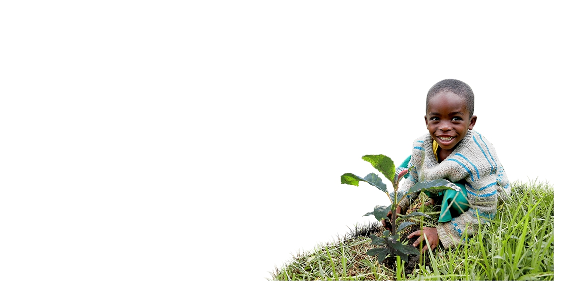 By the way, while we will post from dclick.io , we have to give compulsory beneficiaries to you? Thanks for your comment! Beneficiaries are not applied now. Does the clicking value differ depending upon the geographical location of the clickers? Like tier 1, tier 2 countries! The value of a click from USA, Canada, UK carries great value than those of from third world countries! That is very interesting idea, but we regard all click as same. So you mean , if I delegate 100sp I get 30sp weekly? You receive 30% of the DCLICK Tokens that are issued daily based on leases. We will continue to consider ad reliability in the future. Thank you. I've been wanting to see something like this for ages. Well done on creating something that will give our articles a much longer life than 7 days in terms of monetisation. I'll jump on board with this for sure. This is a great motivator for creating some decent content, which I've been lacking of late. I really like the idea. But you should make sure that there are no ads displayed that advertise scam sites like Cloudmining or Ponzi scams. Because I don't want to promote that kind of sites on my blog. It would be best if we could choose by ourself what ad is displayed. You are right. I also think the reliability of ads is also important. Thank you for your suggestion. This is an awesome thing :) however for me to use it I would have to be able to choose what advertisements are displayed on my posts. Any responsible content creator should take responsibility to be promoting products and companies that adhere to their values. Is it possible to choose what ads are shown on your posts? Also I would prefer to be able to use other platforms for posting for many reasons and still avail myself of this service. I think most serious content creators feel the same as there are too many advantages to platforms like partiko, steempeak and busy. I think addressing those 2 concerns would make this a serious dapp. Thank you for your comment :) You can not currently select ads. However, we plan to add a ad category function in the future so that people can put the best possible ad for their contents. Also, like Google AdSense, we are working on the function to put ads in other posts. Until the function developed, You can copy the ad markdown attached to the bottom of your content and put it in another post to get the same effect. It's a great concept for steemian. @tipU voting service guide | STEEM Monsters Lottery | Quick SBD <-> STEEM Exchange | For investors. This is an amazing initiative, let's hope everything works out A OK.
Great work! At this point, the overall amount of traffic generated will be smallish as will be the buying pressure on STEEM but that will change with growing use of the platform. I like this idea, especially if authors where able to choose what ads are shown by category or tags. Such a great initiative. Keep up good work! You should use voting bot to promote this post so that people may read it. This sounds like an interesting project. I hope to read an update on your project soon. Thank you for your suggestion. We are currently developing features that make it easy to put ads in different places. Then, creators can get ad revenue by inserting code or images anywhere. Is there a way to use your service without SteemConnect? I have a @Steemit account, but do not use SteemConnect. Can i monetize old posts, or must i post through dclick? If you teamed up with steampeak I'd be in, for sure. In the moment the post should be posted through dclick.io. I am sure that the team on dclick is working on further functions, but this is the status quo. This is an amazing project and a great way of integrating ads into Steem. Your website is simple and stylish and the delegation program seems to rock already. I have jumped aboard and delegated some SP to you. Fantastic idea and execution. Hi Flauwy, nice to have you also hear and great to know that you already delegated. I have seen already your posts with a dclick ad. :) The future for SMT is really bright if we can get projects like dclick out to the public! Is there an example steemit post that has dclick ads I can view? 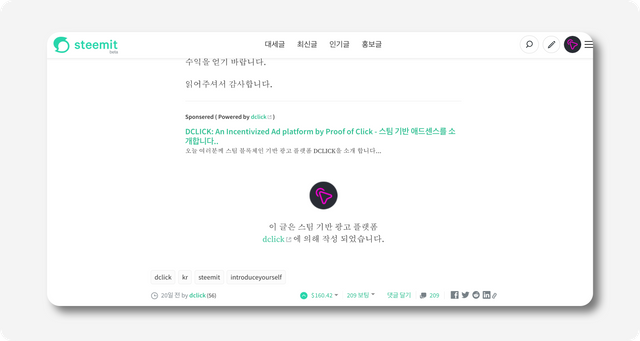 dclick started the service in the KR community first, so almost the whole KR community is currently based on dclick.io postings. I can forward an older article from me. It is in Korean but you will see the ad listed at the end of the text. Hope it helps. This is wonderful idea. One Steemit user @dwarrilow2002 came with such an idea when he introduced his website steemhost.com. His idea was great but could not do much as he had not sensed what such an idea can produce. It seems to me that @dclick will be a great success. I have started follow you and going to join this platform. Wishing you lot of success. I am sure that the dclick team wil love your kind words. Personally I think we as Steemians need this kind of services with the potential to break out of the internal Steem community and reach the regular internet community out there. Would love to see starting bloggers using dclick ads to maximize their income~! Definitely, I will use dclick. if i advers, can i choose spesifik tags? Tagging is only when writing an article, so you can choose all kind of tags you want. Only the first tag will be fixed to dclick. If you advertise, the ad is as far as I know just distributed in the moment, as dclick just started to collect advertiser. But the functions are growing really fast. I have subimmted an article with this function. Hope it works well. Just checked your articles and they are working well with dclick~! Have fun! Google Adsense is a marketleader :) But I think the concept we have here with dclick is a new kind of era so it will be very interesting if dclick can disrupt the scene. Wow, I'm in and will be delegating SP... resteeming. Wow! All these projects, steem is gonna break the roof. @dclick been trying for a day to post now to no avail what may be the issue and when will it be solved? ;) Thanks in Advance! Hmm. that seems odd. Will let the development team know about it and they may come back to you with questions. This post will be featured on our LIVE broadcast tonight at 9:30pm EST on @vimm! If you're available we'd love to have you join us to discuss your post by jumping on the Pile! Again, great work and we hope to see you tonight! How are you guys gonna manage fake clicks? Like people can create multiple accounts and click on ads, right? We already have an abusing detection system. Details can not be disclosed, but only one click is counted as valid. Can I see the token distribution detail somewhere? How many tokens will be issued in total? I saved this post and will give it a try. As I understand I need to use an other app? Is it possible to use different apps or? So much progress, it's really good to see all these great new services taking on form. Sounds great. Will look forward to this as it develops. Good luck!